The weather in west Michigan is spectacular. Here it is mid October, and we have eighty degree temps, bright blue skies and the color from the changing leaves is blinding in its beauty. My computer is on the kitchen table, so I write here everyday at this huge window. The view changes constantly. I am concerned because with all my travels to and from Pennsylvania to see Jen and the baby, and to my mother’s house in mid Michigan, the birds haven’t been fed regularly and I am trying to lure them back with delicious treats. Watching the birds has brought Jim and I so much joy since we moved here. 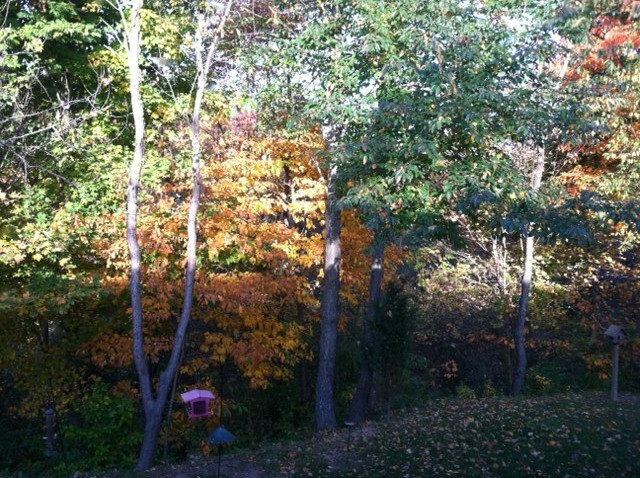 Jim also made the observation that some of the trees are changing color as we observe them in a day. The bright orange one in the foreground changed from a bland brownish green to bright yellow in one day as we sat and worked at the table. I need this lovely respite from the angst of my mother’s death and the concern over the well-being of my mentally retarded sister, Sarah. So far, unfortunately, most of the brunt of the work has fallen on the shoulders of my sister, Liz. She and I together work like a well-oiled machine. But I remind her daily that I am eleven years older then she is. I feel my age today. Another thing I must remind her is that our mother has only been dead for eight weeks. In that short time, we have resolved most of the major issues that plague family members post death. What is left after the scurrying and rushing is the pain of our mother’s absence. A wonderful help has been the stories I am hearing from loving friends and family about their experiences with the death of their loved ones. The most painful are the memories concerning the loss of children. A dear friend who lost a son twenty five years ago is on the continuum of grieving. That does not go away. Oh God, please, people shouldn’t have to go through that horror. We don’t see what possible use that has in the realm of the supernatural. Thankfully, more of the experiences have to do with those who have lived their lives fully. But it is still not easy to go through, regardless of the age. Another friend confided that she has been thinking about her mother a lot lately, and she has been gone for about ten years. The last years of her pain filled life were not easy. It may have been a blessing that she didn’t suffer. But that does not make it easier. You can tell yourself when the unexpected moment arrives; you are standing in line at Walmart, or holding your new grandchild for the first time, or hearing about an older person living in a nursing home,it is better off this way, it was a blessing. No offense, but that is bull. It isn’t a blessing when someone you loved has died. I don’t care if they are one hundred years old. The stories continue to lift me up as I reread them. A childhood friend spent ten days at her mother’s bedside until she died peacefully on Christmas morning. The time was spent with a niece, listening to favorite music and looking through old family photograph albums. My friend wrote, ‘it is one of the sweetest memories of my life. We knew, really knew, that she could hear us and that she loved having us there in her bedroom with her. I will always be so glad that she was able to be at home and that I was with her.’ I know that my mother was aware that Liz and I were with her at the end, too. It is one of the few certainties I have about the experience. Drinking oneself into a stupor was the way another adult child coped with the pain of having to care for his dying mother. There is always one child singled out in the spiritual realm who does most of the care-giving. Why is that? It would be so much easier if the responsibilities were spread around a little bit. I am so grateful to Liz for being my partner at the end of my mother’s life. How would either of us had done it alone? Yet I keep hearing more and more that is the norm. Today I am going to work a little in my studio. My publisher gave me an assignment I must complete today; the sequel to Pam of Babylon is coming out in a few weeks and that time before publishing is always hectic and stressful. I want to putter around my own house. These activities will take my mind off other, more stressful topics. Liz and her daughter are at Micheal’s, buying screen printing supplies. Melissa and I taught ourselves how to screen print last week. I am drawing duck pictures on the screen and printing them on a big piece of muslin, for what use; I don’t know yet. But all the while, the white noise will be in there; the aftermath of the death of someone who had a complicated life to say the least, and my involvement with the resolution of all the issues that come with finalizing, decision making, closure. When my dad died twenty-five years ago at the young age of fifty-seven, a well-meaning acquaintance said, “don’t let a spirit of grief attach itself to you.” What the hell did that mean? I think it meant, “Okay, you’ve talked about it for a few days now, we are sick of hearing about it, shut up already and get over it.” My mother has only been gone for less than two months. I am just getting started. Footnote: If you would like your experiences with the death of your parent or loved one included in a paper I am writing, please send me a note and I’ll send you more information about submission. This entry was posted in Death and Dying, Family Life by Suzanne Jenkins. Bookmark the permalink. Well said sister. I love you. One day at a time. Some days are bad and some are good. It’s always with you. With the Lord’s help we get through it.